I knew I’d come across images of autosacrifice in the codices before! I’ve included two below so you can see how the Aztecs depicted themselves performing ritual bloodletting to benefit the gods. 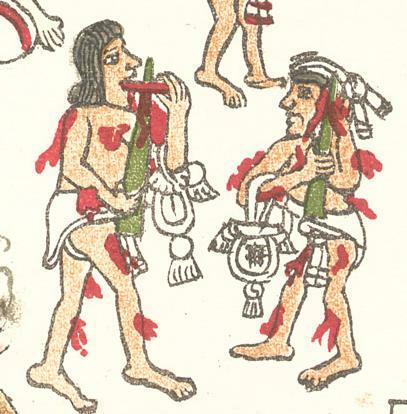 The image above is taken from the Codex Telleriano-Remensis, a Post-Conquest religious text painted by Aztec artists in a style that is a hybrid of Mexican and European art. 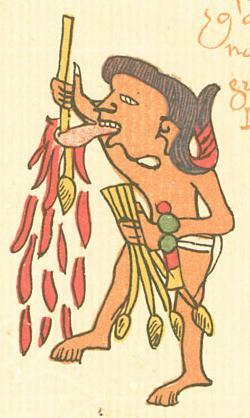 The worshipper is piercing his tongue and letting the blood flow as a gift to the Teteo. The tool in his hand looks like a pointed stick, rather than a thorn, bone perforator, or obsidian shard, so I believe this painting may be depicting the practice of “drawing straws through the flesh” I mentioned in my article on traditional forms of autosacrifice. If anyone’s got more information on this particular image, I’m all ears. This second image comes from the Codex Magliabecchiano, another Post-Conquest codex drawn in a European-influenced style and speaking of religious subjects. This picture shows a group of worshippers doing many different forms of autosacrifice. One is piercing his tongue, while the other is piercing his ear. The green coloration of the objects they’re using to bloodlet makes me wonder if they’re either exaggerated maguey thorns or perforators made of jade. Given the traditional use of maguey thorns for this purpose and the association of jade with blood (as both are exceedingly precious), I could go either way. Again, if anyone knows more, please drop me a comment. Additionally, we can see that these two worshippers have already completed more rounds of bloodletting than the forms they’re in the middle of in the picture. See the blood on their arms and legs? They’ve either been piercing in those places, or have nicked themselves with shards of obsidian or flint. Incidentally, the bag-like objects slung over their arms are traditional incense pouches. They were often made with paper and beautifully decorated, and would be filled with copal resin to be burned for the gods.